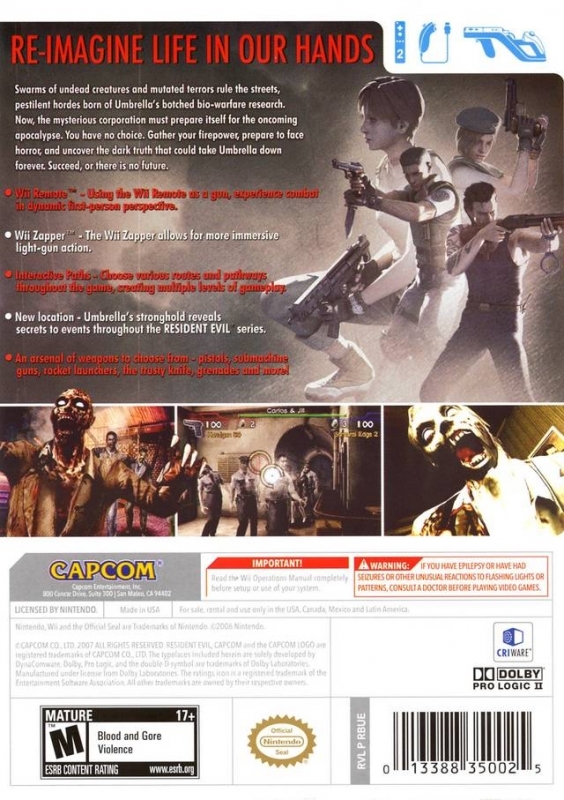 Capcom's original Resident Evil offering for the Wii. 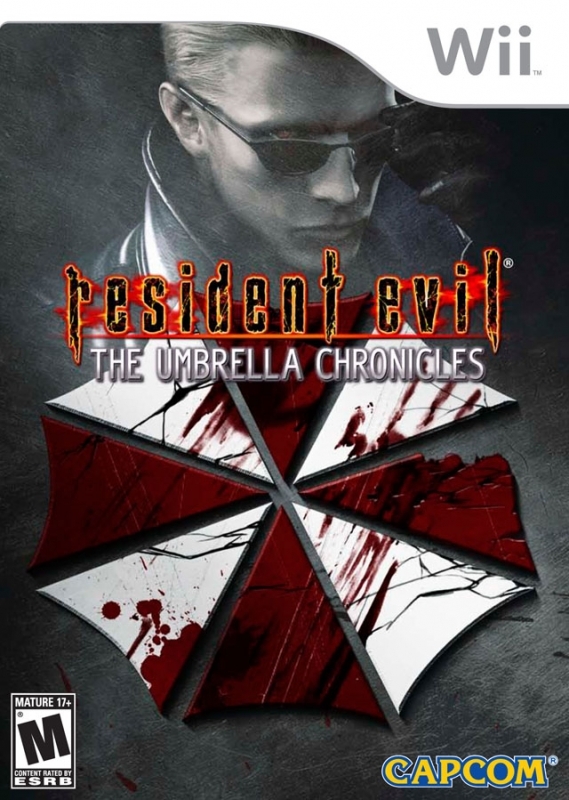 Resident Evil: Umbrella Chronicles follows the events that led to the downfall of the Umbrella Corporation, as detailed in the Resident Evil games up until Resident Evil 4 (and yes, unfortunately that does mean there are no levels based on Resident Evil 4 here). It’s basically a recap of some of the key events in Resident Evil, Resident Evil 0 and Resident Evil 3: Nemesis, and briefly mentions Resident Evil 2. 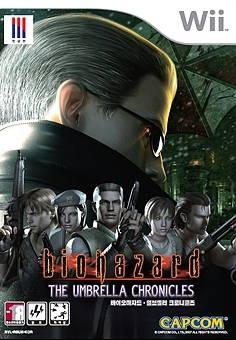 Umbrella’s downfall is broken up into four separate case files, featuring eight playable characters from the series. However, they all handle identically, so the main impact of having eight different characters is only really felt in the cut-scenes. 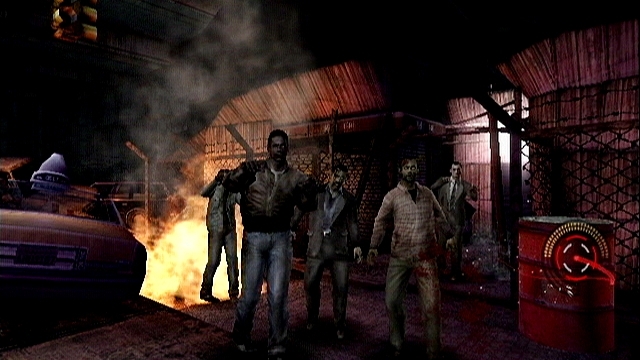 Due to the nature of the way these different events are detailed, newcomers to the series may feel a little lost, but the game really delivers a great fan service by recreating these events and updating them (although the relative absence of Resident Evil 2 and Code Veronica may come as a slight disappoint to fans). 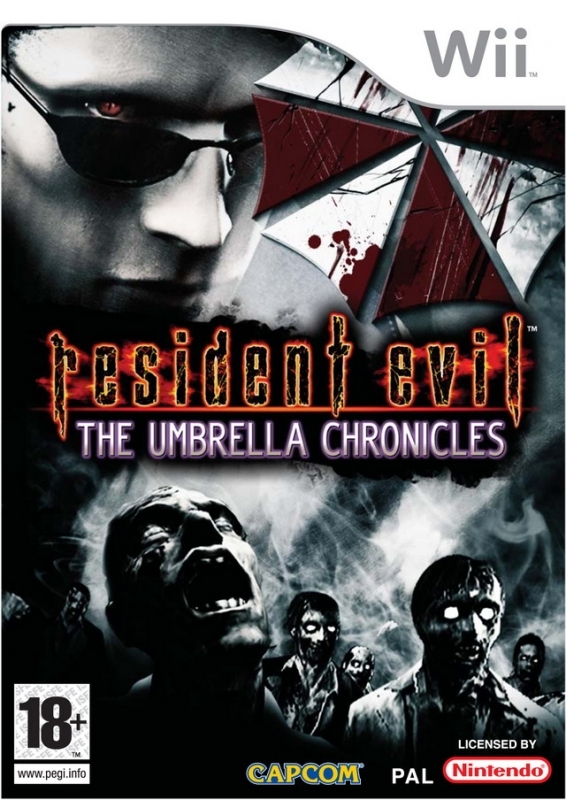 Umbrella Chronicles is essentially a light gun game made for the Wii, so players simply point the Wiimote at the enemies on the screen and then shoot. Variety is introduced to this basic gameplay mechanic through the use of enemy weak points, which if hit result in a one-hit kill. 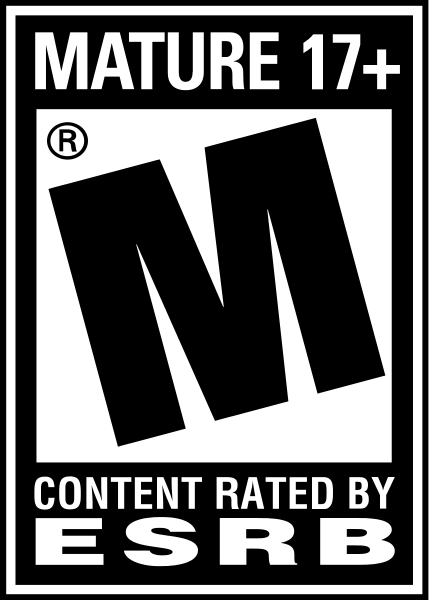 Other more minor gameplay elements include quick-time events (which will often involve shaking the Wiimote, for example), knife attacks (particularly useful for the annoying little insects that will quickly engulf your screen if given the time), and grenades. 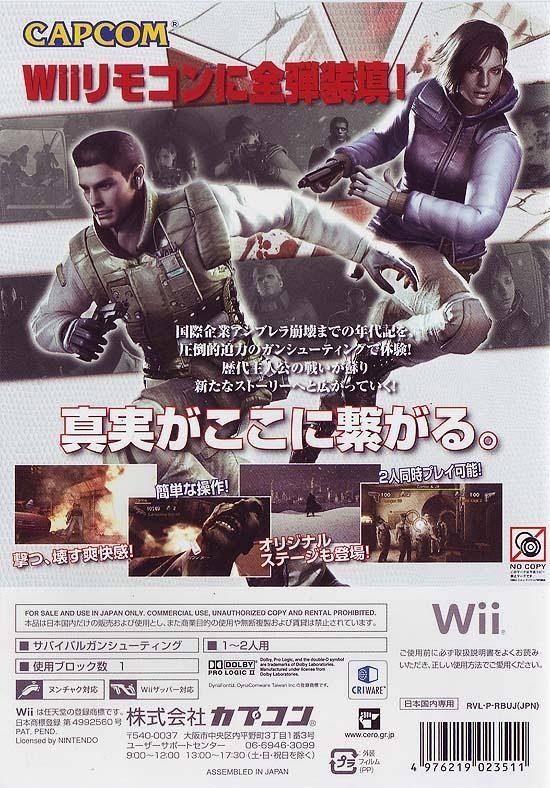 It’s very much a rail shooter, in that almost all of your movements are controlled by the game itself, so if you like to explore every corner and grab every item, this probably isn’t the game for you. Whilst the Nunchuk can be used to pull the camera a little to the sides (to find hidden items or kill off-screen enemies), the entire movement of your character and the camera is very much out of your control. 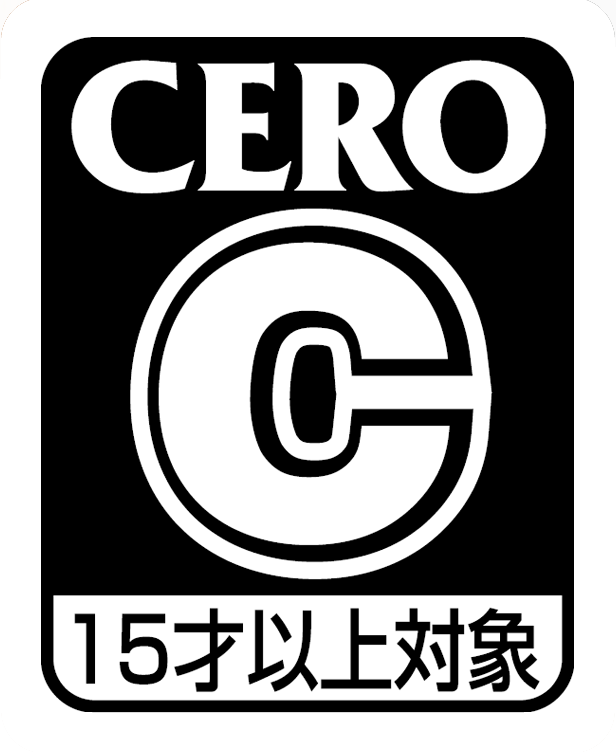 This frees you up to focus on the core gameplay of shooting, but it also means the game can get tiresome quite quickly because of its reliance on one core gameplay mechanic. Initially you only have access to a handgun which has infinite ammo, but you’re quickly able to unlock additional weapons as you progress, such as the shotgun and sub-machine gun, all of which have very limited ammo, so conservation is very much the order of the day. Knowing when to use which weapons quickly becomes vital, although you may find yourself somewhat hindered by the fact that even when you run out of ammo that weapon will still pop up when you’re scrolling through your weapons in-game, which can be pretty deadly given the necessity of fast reaction times. There’s no avoiding a weapon when it runs out of ammo, so weapon selection is awkward and problematic. One nice feature is that at the end of each mission you’re assigned a rank, based on factors such as completion time and critical hits. The better your performance, the more stars you will receive. Those stars can then be used to upgrade your weapons to hold more ammunition and do more damage. The ability to upgrade your weaponry is a great addition to the game and introduces a new gameplay dynamic that allows you to exert more influence over the way the game is played. One thing I did notice whilst playing through the game is that hit zone detection can be a little inaccurate at times. This is in part compounded by the fact that the reticule is quite large and sometimes hard to control because of your natural hand movements. It adds to the challenge, although I’m not sure that all of this was necessarily intentional. 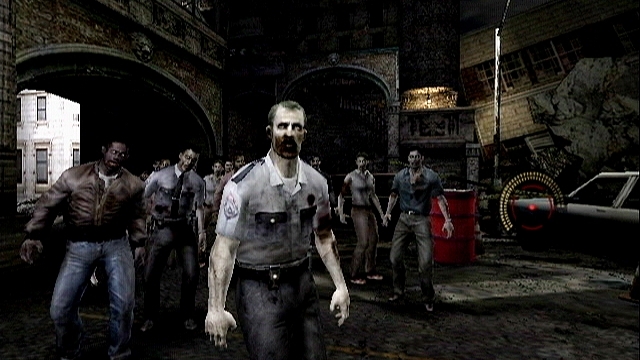 You’ll primarily be destroying hordes of zombies, but there are lot of different enemies, including rabid dogs, insects, some iconic bosses, a heck of a lot of unidentifiable monstrosities, and most annoyingly of all, leeches. 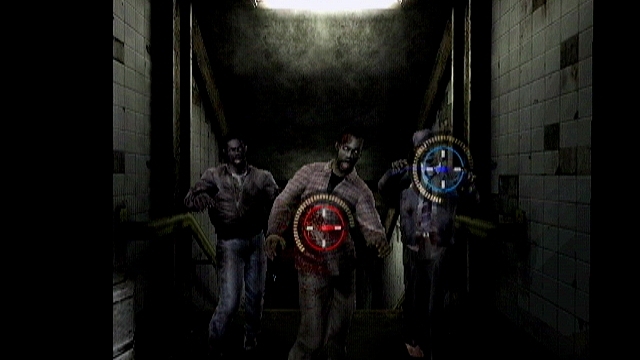 The zombies are particularly notable thanks to the varied character models. They wear different clothes, have different facial features, and are in varying stages of decay. The models are quite blocky though and aren’t particularly well defined, which is something that stretches across all of the monster types. I think there’s a major missed opportunity in respect of enemy reactions. 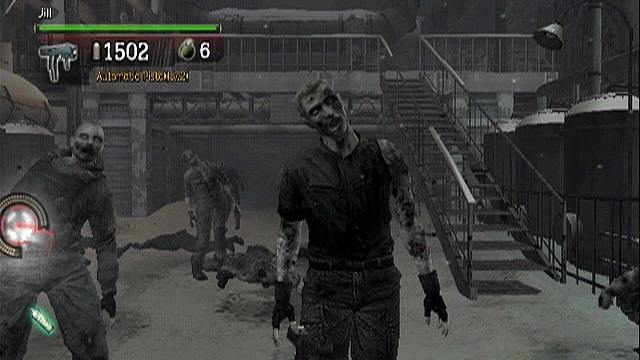 As it is, a shot to the head of a zombie is as satisfying as ever, and they’ll stagger in reaction to some of your bullets, but there’s an overall lack of effect that is a little disappointing. It would be great if your shots could cause massive amounts of visible damage, so that holes appear in your enemy where your bullets have blown off chunks of their body, but this doesn’t really happen beyond the usual head-shots. The environments are also a mixed bag. As you can probably tell from the screenshots, some of the backdrops are nicely detailed, and it’s great to see some iconic levels re-imagined for a rail shooter. 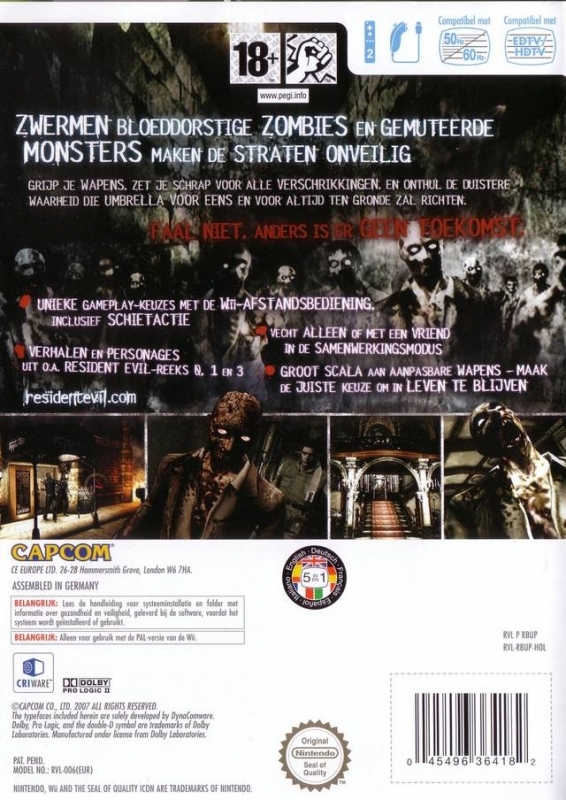 But others are quite bland and lack the art style and the feel of the vibrant world that was really impressive in Resident Evil 4: Wii Edition – the world here can feel stale at times. Overall I would say the graphics are slightly above average, although they fall short of the game’s older cousin in most respects. 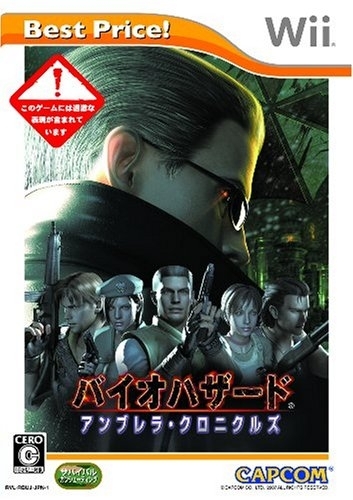 The music is quite adrenaline-fuelled, often shying away from the survival horror nature of previous games in the series, and opting for the pulsating music that the arcade side of the rail shooter genre is synonymous with. 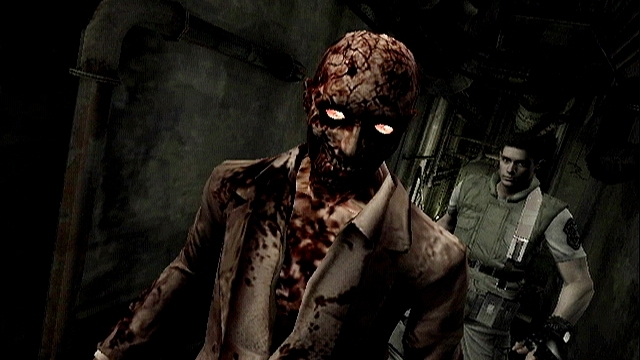 I wasn’t that keen on the music - the moments when all is quiet and haunting are when the Resident Evil atmosphere shines through, a re-imagining of the music from previous games in the series might have been preferable, but as far as the genre goes, the music is well suited. The voice acting is as awkward as ever, so it should appeal to Resident Evil fans, and the weapon sound effects opt for a more arcade-like end of the spectrum. Zombies grown, heads pop, guns blast, it’s all there and working nicely. As far as value goes, I found it took around 6 hours for me to complete the core story segments of the game, which is obviously quite short, but there are a few mitigating factors. 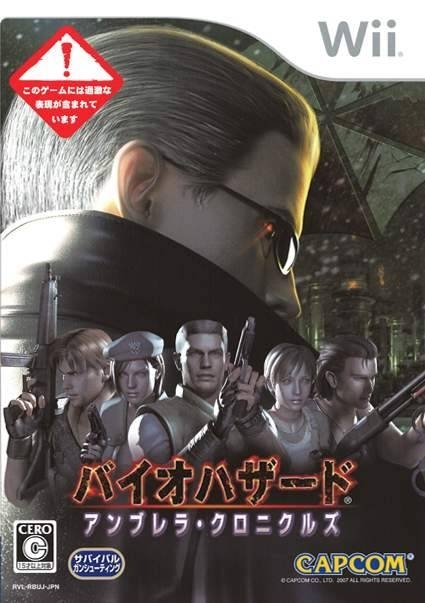 Firstly, the game is filled with bonus missions that expand upon the story and feature even more characters from the Resident Evil series, like Wesker and Rebecca. In all they almost double the length of the game, so they certainly add a fair bit of value. Secondly, the inherent pitfall of the rail shooter genre is that gameplay often becomes repetitive, and therefore gets boring quite quickly. On the flip side, however, the genre is also extremely accessible, so it’s certainly a game you can quickly pick up and play, and come back to every now and then. Finally, building upon my second point, the game features two player co-operative play. 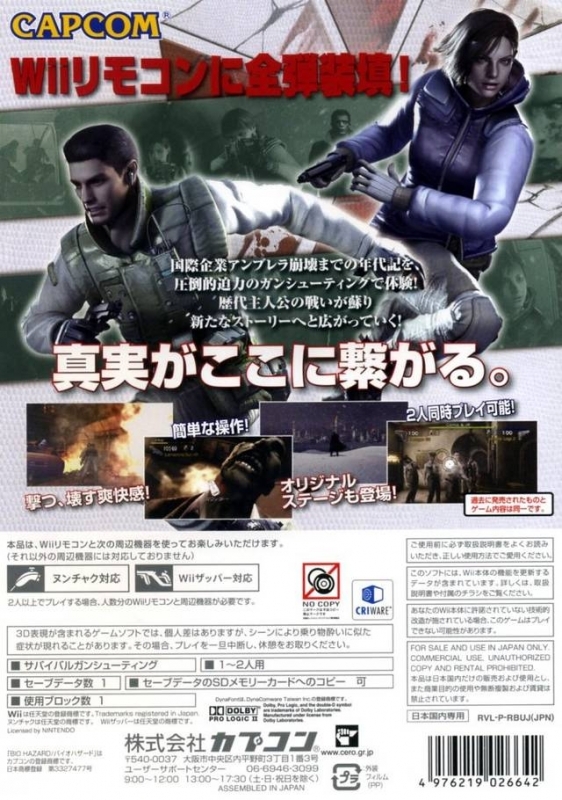 Given the accessible nature of the game this means that it’s a great game for a quick blast with a group of friends, although only the main missions can be played co-operatively and the familiar problem of confusing your reticules on the screen is present, and the weapon upgrade system hasn’t been transferred over to co-op as well as it could have been. 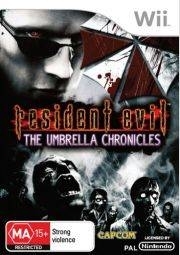 Resident Evil: Umbrella Chronicles is a solid, if slightly average rail shooter. I found that the gameplay had become just too repetitive by the time I had completed the game, and felt little inclination to replay the game beyond taking advantage of the two player co-op. It’s a great ‘pick up and play’ game, with a lot of accessibility thanks to the fun to be had from mindlessly shooting zombies and other undead creatures. Lacking in depth of gameplay and content as it is, I would probably only recommend it to fans of the genre if they can get it cheap, and of course Resident Evil fans, but even then I would certainly recommend Resident Evil 4: Wii Edition over this. I didnt know they took UC and DC and made them Rail Shooters for the series. 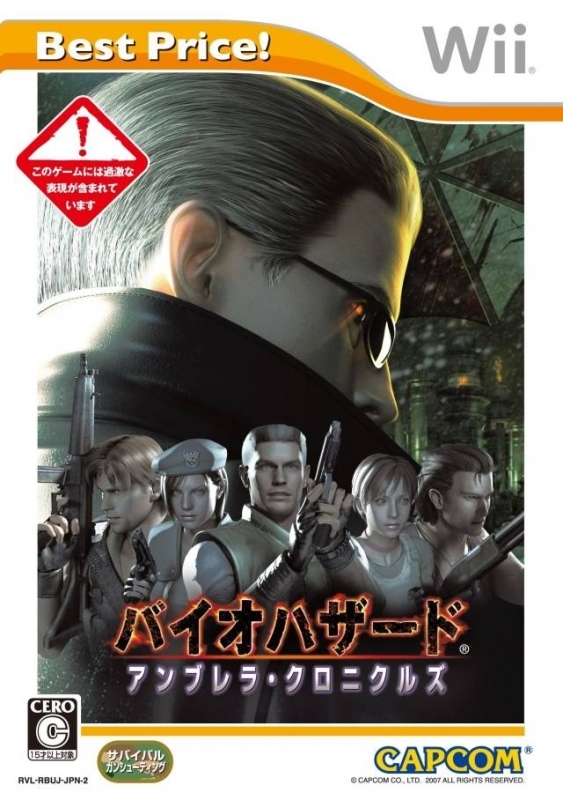 Also didnt know what a rail shooter was until I played this... simply awesome... the only way to play Resident Evil Zero by the way!! 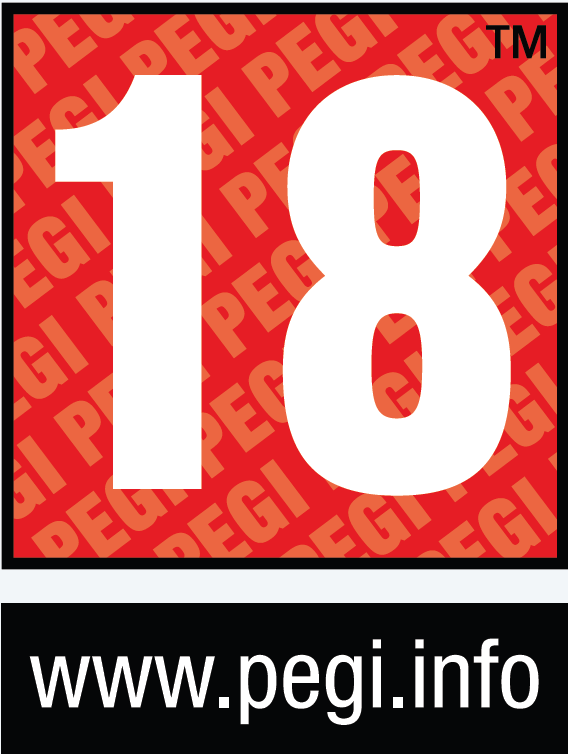 I want to buy this game, can't find it where I live though. I love on rails shooters, they're so much fun to play with my brothers or friends. Glad to see it sold very good! Just got this, it's a lot more difficult than I expected, A huge change from HotD Overkill.